What is a django model? A model is a class that matches a database table (or collection). Models are defined in the apps models.py file, /app/models.py. Say what? Let’s make an app with a database model! We start a new project, movie database. A database is already set up! We’ll use the default database system: sqlite3. Django sites can have many apps. Each app is like a plugin. Let’s make a movie details app. You have just created an app! There’s a new folder: movies. Note: Django doesn’t know it should use this app yet. Apps are not added by default.. Let’s teach django. Scroll down to the line INSTALLED_APPS and add the line ‘movies’. We can create our model now. In the movies/models.py you can define all models. Create a class for your movies model. The class will map to the database table. We class will contain attributes of our movie object. In English, that means it’s just created our database table! 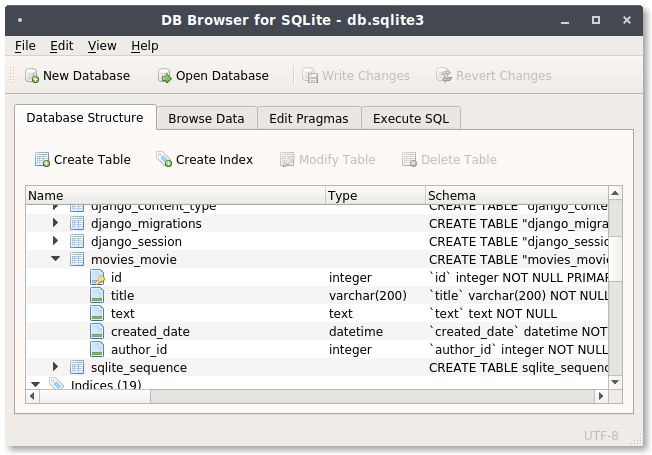 Open the database file (db.sqlite3) with sqlitebrowser. Yeehaw! Our movie model is now our database.